Full disclosure: I know and love Dennis’s wife and bought this book based on that and the fantastic story of discovery how Eat Delicious came to be. So when it was on sale and available for pre-order I didn’t hesitate and am so glad, along with my family, that I did. Flipping through the book I quickly spotted some recipes I wanted to attempt right away. The first one I made was the chicken wings with Sticky BBQ Sauce and, although I did things a bit differently based on my impatience, they turned out amazingly! Then it was the Slow Cooked Pulled Pork but we put it on nachos instead of on sandwiches and yup, it was delicious! 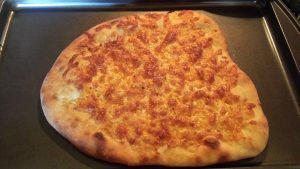 I let my 7 year old pick next and because he was confident in the recipes already he trusted that whatever he chose it would work out. 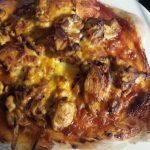 He was right and this time we did follow the recipes very closely to make the BBQ Chicken Pizza and Garlic Fingers, with donair sauce. My son wanted to modify things when he saw the red peppers on it but I carried on and am glad I did. We couldn’t get enough and it was one of the first pizzas I didn’t scrape the onions off of! Every recipe has a gorgeous picture, taken by Dennis himself, which I appreciate tremendously with respect to a cookbook. We are definitely eating deliciously these days and all eager to continue doing so! If you eat, and want to enjoy your food… go get Eat Delicious now!